The orthopedic clinical specialist application may be tricky, but have no fear! We've got the guide that keeps your attention focused on treating patients rather than researching application processes. In support of physical therapist's autonomy and the advent of the doctorate degree in physical therapy, Hart & Dobzyrkowski (2000) data showed that physical therapists with the OCS are more efficient than clinicians without OCS. In an ever volatile healthcare environment and the rise of healthcare costs, improving patient outcomes in the least amount of time has become essential to the profession of physical therapy. Furthermore, Hart & Dobzrykowski (2000) postulate that quantifying outcomes have help revolutionized clinical accountability and effectiveness not only with other medical fields but with physical therapists as well. This goes without saying that evaluating clinical outcomes would be incomplete without an assessment of resource utilization (Hart & Dobzyrkowski, 2000). The American Physical Therapy Association (APTA), in response to this shift in stressing clinical outcomes created one of the earliest specialist certifications with a concentration in Orthopedics. The OCS certification program was established to provide formal recognition for physical therapists with advanced clinical knowledge, experience, and skills in a specialized area of practice and to assist consumers and the health care community in identifying these physical therapists. It also helped demonstrate that physical therapists are devoted to addressing the unique needs of the people with whom they work. In support of physical therapist's autonomy and the advent of the doctorate in physical therapy, Hart & Dobzyrkowski (2000) data showed that physical therapists with the OCS are more efficient than clinicians without OCS. This all boils down to that patients require fewer visits, with less cost per visit, and improved outcomes over the period of care. Specifically, the OCS group had better value (unit of functional improvement per estimated dollar) and utilization (unit of functional improvement per visit) for the constructs of physical functioning outlined in the study (Hart & Dobzyrkowski, 2000). Physical Therapists with the OCS designation help show the general population as well as other medical professionals that we are and continue to be one of the first entry points for musculoskeletal care. The schedule for the 2018 exam has not been posted as of present. Please see http://www.abpts.org/home.aspx for future dates when they are posted. Applicants must hold a current permanent/unrestricted license to practice physical therapy in the United States or any of its possessions or territories. Applicant must have completed 2,000 hours of direct orthopedic patient care as a licensed physical therapist (excludes temporary license) within the last 10 years and 25% of it being in the past 3 years in order to begin the application process (Review orthopedic specialty area described in the Description of Specialty Practice (DSP) in order to understand what direct patient care represents. http://iweb.apta.org/Purchase/ProductDetail.aspx?Product_code=E-46). 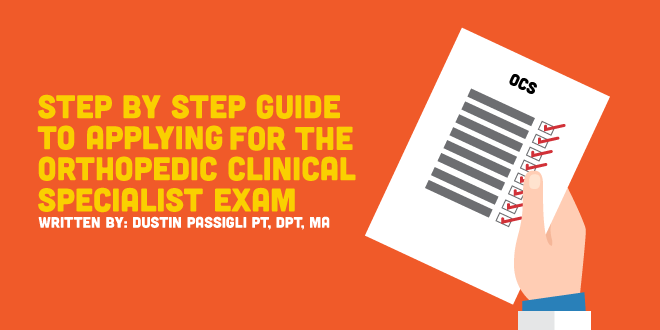 Second option is by submitting evidence that the individual practitioner has or will have completed an APTA accredited post-professional clinical residency that has been completed within the last 10 years. The curriculum of said residency must follow and reflect the mission of DSP guidelines. If the individual is currently completing the residency, they will be conditionally accepted to sit for the exam as long as they provide appropriate documentation no later than 1 month before the examination window opens. To complete the application with a discounted price, the applicant must be a member of the APTA. See http://www.apta.org/Benefits/ for benefits of APTA membership and the guidelines on how to become a member. An applicant may apply to sit for OCS exam without being an APTA member; however, the applicant will incur larger exam fees (https://aptaapps.apta.org/CreateAnAccount/NewAccount.aspX - Website to create an account for non-APTA member applicants). To complete an application, an individual must pay an application review and examination fees. The application review fee is non-refundable. After paying your application review fee, applicants will be given a copy of the DSP as well as the appropriate Self-Assessment Tool for Physical Therapists. Please allow up to 6 weeks for application review following online submission. Please visit http://www.abpts.org/Resources/ExamOutlines/Orthopaedics/ for a breakdown of the 2 exam components 1) the practice dimensions and professional responsibilities and 2) the knowledge areas and procedures. Outlining body regions may provide the applicant direction in regards to a study regime and areas of strengths and weaknesses. As Muhammad Ali has said, "He who is not courageous enough to take risks will accomplish nothing in life." Many newly graduated therapists wonder if the OCS is for them? Is it worth the time, money, and effort to go through the application process, studying, and another standardized test? I say, yessss!!!!!!! There needs to be a fundamental change in how physical therapists look at how much knowledge they know, their ability at clinical reasoning, and the importance that evidence has in informing their base of practice. Reimbursement for physical therapy services has changed so that patients/clients receive fewer visits and co-pays are higher than previously. It continues to be our job as autonomous clinicians to provide care that is highly focused, patient centered, and can provide the patient with better function and quality of life.